Mystery man in Marcella’s locket! This is a bit weird. After much fiddling I worked out how to get the photo out of Marcella’s locket. Naturally it contains a photo of her husband James Beatty which you can now see under “Image gallery– Beatty, James and family”. The tiny photo may have been taken the same day as our earliest photo of him (around 1873?) as he appears to be wearing the same suit. The locket itself is decorated with the intertwined letters AEI (Amity, Eternity and Infinity) in decorative red and white enamel, the enamel now much damaged. It has a case which was obviously made to fit it, which is labelled “Waterhouse & Compy, The Queen’s Jewellers, Dublin”. Presumably it came from Ireland with the family in 1878. I wonder if it was an engagement or wedding present from James to Marcella? 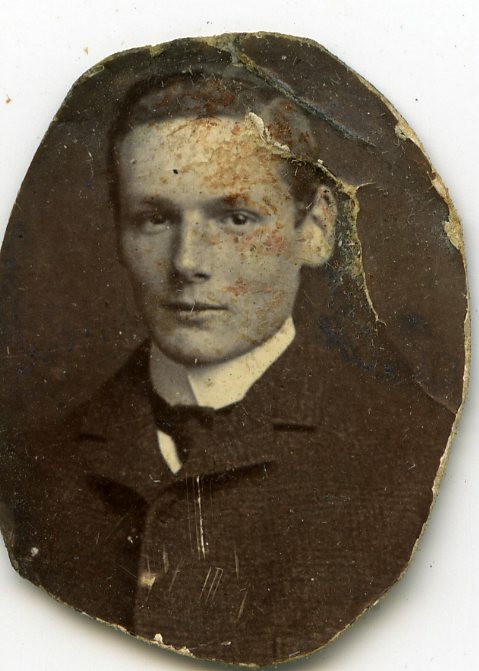 The weird thing is this photo (here very much enlarged) of a very young man – a boy perhaps – which was hidden underneath James in the locket. Who the heck is this?